Left: Flying butress, Chapter House, Lincoln (1220). These varied but little from the Norman. The vaulting as it advanced modified the planning, as, when pointed arches were finally adopted, nave compart- ments were made oblong in place of the former square divisions. Flying buttresses were introduced. The "broach " spire, in which the upper portion rises from the square tower without a parapet, is characteristic. Buttresses are more pronounced than in the Norman period, being generally equal in projection to their width, in order to resist the lateral outward pressure of the pointed vaults, and  were formed into stages by weathered set-offs (Nos. 127 A, B, and 141 B). Their arrises were often chamfered, and the different stages were frequently gabled. Flying or arched buttresses (No. 141 E) were first utilized in this period, but were not of common occurrence till a later period. In the interiors the nave arcade usually occupies the lower half of the height, the upper half being divided equally between triforium and clerestory, as at the choir of Ely, the naves of Lichfield (No. 124 c), and Lincoln ; but sometimes, the triforium was diminished in order to provide a larger display of glass, as at Westminster (No. 127 c) and Salisbury (No. 122 c-). Proportions, generally, are more slender than in Norman work, and pointed arches came into general use for constructive reasons, at first in connection with vaulting, then gradually throughout the whole building. The doorways are often richly treated, and ornamented with carved foliage. 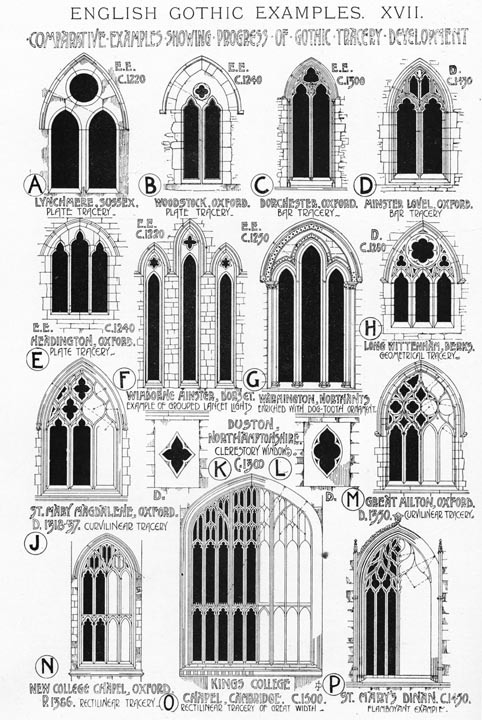 Windows are of lancet form, and tracery was developed, especially the early form known as "plate" tracery, so-called because the openings were cut through a flat plate of stone. Cusps or projecting points of Gothic tracery were introduced in the latter part of the Early English style, being let into the soffit of the arches in separate small pieces and entirely independent of the mouldings. This form of detached cusping is found generally in the circular lights, the heads of windows having cusps forming part of the tracery itself. The spaces between the cusps are known as foils (Lat. folium = "a leaf") being trefoil, quatrefoil or cinquefoil when having three, four or five openings. Narrow lancet windows are grouped in two, three, or even five lights, as in the "Five Sisters" in the north transept, York (page 316), the glass being usually kept near the exterior of the wall, making the inside jamb very deep. Piers consist of a central circular, or octagonal shaft, surrounded by smaller detached columns (No. 146), often of polished Purbeck marble, held in place by bands at intervals, as at Salisbury (No. 123) and Westminster Abbey. Capitals were frequently moulded, so as to produce fine bold shadows (No. 146), or carved with conventional foliage (No. 148), placed on the bell or lower portion of the capital. The normal abacus is circular on plan. These are bold, deeply undercut, and often of pear-shaped section, following the outline of the rectangular recesses (No. 146). The chiselled dog-tooth succeeded the axed nailhead decoration of the Norman period. The most characteristic ornament is the dog-tooth, which was generally placed in hollow mouldings, and was used in great profusion (Nos. 143 and 147). The chisel was generally used, taking the place of the axe in the Early Norman period. Carved foliage is conventional, and crisp and fine in treatment (No. 147), typical examples consisting of convex curling masses, known as " stiff leaf foliage." Flat surfaces are often richly diapered, as in Westminster Abbey (No. 127). Sculptured figures of large size were used, and placed in niches with canopies over them. The west front of Wells (1206-1242) has 300 statues, being a grand composition where sculpture is fully combined with architecture. In regard to color work, it has been suggested that the carved diapers of this and the next period are copies in stone of the hangings or painted decorations of the previous period. There is ground for believing that such carved diapers were colored, as was the case with Greek and Roman ornament. Stained glass rapidly increased in importance, the pieces being small and leaded up in patterns sn as almost to suggest the cubic formation of mosaic. A general tone of color pervades the windows, and an unrivalled deep and violet-like blue was a favourite tint, as in the fine thirteenth century glass at Canterbury Cathedral. In the Early English and following periods, exquisite decorative art was produced in such works as the Psalters, Missals, Books of Hours and Chronicles, in which the huntsman, fisher- man, shepherd, labourer, scribe, saint, king, knight and monk were represented, forming a valuable record of contemporary life. The Mediaeval Room at the British Museum contains examples of armour metalwork, ivory and woodcarving, caskets, rings and utensils, illustrative of me ornamental art of the periods. Fletcher, Banister, and Banister F. Fletcher. A History of Architecture on the Comparative Method for the Student, Craftsman, and Amateur. 5th ed. London: B. T. Batsford, 1905. Pp. 335-41.